Nowadays, modern surface protection has to fulfil various functions. These include the protection from wear, corrosion, UV radiation, dirt and the defence against bacterial coatings. 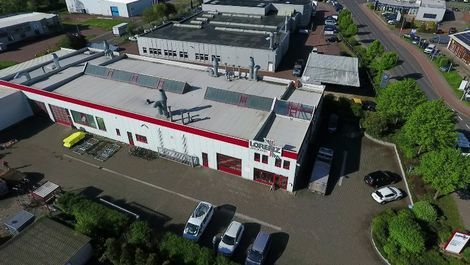 Lorenz-Lackierungen GmbH & Co. KG in Schönebeck near Magdeburg is a specialist for industrial and vehicle paintwork of all kinds. From small parts the size of a doorbell to industrial systems and vehicles the size of a truck. Around three dozen of employees are able to paint everything that can be painted – from glass to plastic to metal. The painting company, founded by Walter Lorenz in 1932, was specialised in vehicle paintwork and car body work in the 50s. Today, the services of the company also include industrial painting work as well as painting work in the home sector such as furniture, doors or radiators. “Recently, we have increasingly focused on industrial paintworks,” says Martin Blitz, managing director. For example the special coating on the brake hollow shaft of the ICE-2 on which the mechanical brake discs are positioned. Since these are safety-relevant components which must withstand very high mechanical stresses, the rail company Deutsche Bahn sets particularly high quality standards on all partners who are involved in the production. By participating in this year’s InnoTrans, the world’s leading international trade fair for transport technology, Lorenz-Lackierungen wants to expand its nationwide customer relations. The Schönebeck-based company also delivers components and systems to industrial clients throughout Europe. The company’s second mainstay is the paintwork of cars, caravans, motorcycles and commercial vehicles with accidental damages. The work ranges from repairs of small paint scratches, stone chips and parking damages to the more elaborate restoration of the paintwork of vintage cars, many of which are more than 80 years old. While most of the repair works of cars do not take longer than a day, the restoration with a complete rust removal, body work, base coating and special coating can take considerably longer. It is the quality delivered by the experts from Schönebeck that's decisive for the customers; news of this quality has reached vintage car enthusiasts in German-speaking countries and beyond. When it comes to painting materials and processing techniques, great value is placed on top quality, low material consumption and optimal environmental protection. The company converted to water-based multi-component paints - acrylic paints – as early as in the 90s. They are less harmful to the environment than the organic nitro paints used previously. Employees use spray guns that reduce mist in order to protect the environment and to keep the so-called overspray – that is, excess spray – as low as possible. Another low-loss procedure is electrostatic painting. Spray guns that electrically charge the paint when spraying are used in this procedure. The particles can then be applied very effectively to an oppositely charged component. One-component paints with up to 100% solid content are also used. Abrasion-resistant polyurethane coatings that resist aggressive chemicals or have an antibacterial effect are increasingly demanded by customers. Lorenz-Lackierung is currently using a sandblasting system for basic cleaning, five spraying units and three drying units. The largest spray and drying booth is a hall of 19 metres in length, almost 6 metres in width and 4 metres in height. In the hall, systems and vehicles the size of a truck can be worked on. “However, modern technology alone is not decisive for the quality of the results,” says Mr Blitz, managing director. “Accident repair and the painting of small batches depend not least on qualified employees”. Modern industrial robots cannot complete these tasks as effectively as our trained specialists. According to the managing director, the time needed for programming the processing of individual components and the changeover time are still too complex. For years now, the Schönebeck-based company has continuously trained skilled workers, as good painters “do not fall from the sky”. Even if robots are to take on some of the work in paint shops in the future, it requires qualified workers to operate and control them.